Check out Tobi's One Way Lace Slit Maxi Dress Get all glammed up with the One Way Lace Slit Black Maxi Dress. This long lace gown will be the perfect plus one to your next formal event. Featuring a sweetheart neckline, off the shoulder sleeves, and a thigh high slit. Pair this bardot dress with ankle strap heels and statement earrings. Get all glammed up with the One Way Lace Slit Sienna Maxi Dress. 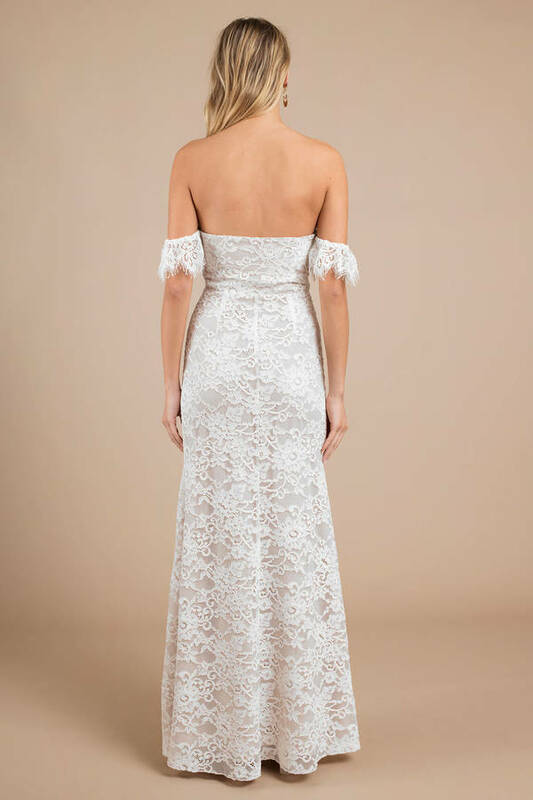 This long lace gown will be the perfect plus one to your next formal event. Featuring a sweetheart neckline, off the shoulder sleeves, and a thigh high slit. Pair this bardot dress with ankle strap heels and statement earrings. Get all glammed up with the One Way Lace Slit White Maxi Dress. This long lace gown will be the perfect plus one to your next formal event. Featuring a sweetheart neckline, off the shoulder sleeves, and a thigh high slit. Pair this bardot dress with ankle strap heels and statement earrings. Get all glammed up with the One Way Lace Slit Black Maxi Dress. This long lace gown will be the perfect plus one to your next formal event. Featuring a sweetheart neckline, off the shoulder sleeves, and a thigh high slit. Pair this bardot dress with ankle strap heels and statement earrings.